Some computers connect to a network or the internet through a proxy server. Therefore the proxy settings should be configured before activating or deactivating a license. 1. In the Activate Bricsys or the License Information dialog, click the Proxy Settings... button. 2. In the Proxy dialog, fill out the necessary fields. 3. Click the OK button to continue. 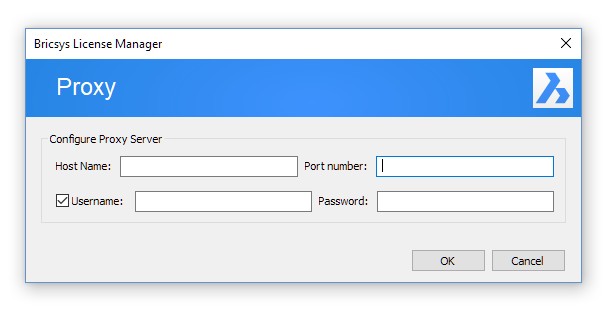 The proxy settings configuration remains active for the current BricsCAD session only. If you need to reactivate or deactivate a license in future session, you will have to reconfigure the proxy settings. 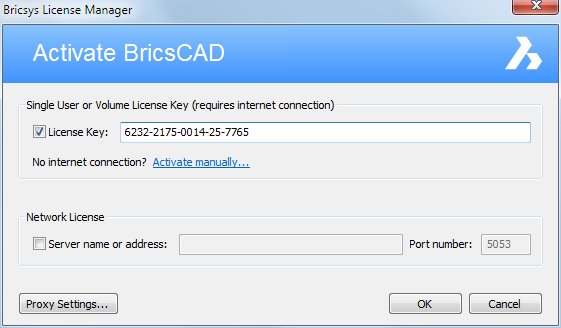 Using a Network license, BricsCAD needs to connect to the license server each time a session is opened. Therefore the proxy settings should be configured permanently.